Netaji Subhash Chandra Bose : The Greatest Indian Freedom Fighter !! Subhash Chandra Bose was one of India’s greatest freedom fighter. He was the founder of the Indian National Army, popularly known as ‘Azad Hind Fauj’. Netaji Subhash Chandra Bose had visited London during the pre-independence period to discuss the future of India, with the members of the Labor party. His sudden disappearance from Taiwan, led to the surfacing of various theories, concerning the possibilities of his survival. Subhash Chandra Bose was born on 23 January 1897 in Cuttack (Orissa) to Janakinath Bose and Prabhavati Devi. Janakinath Bose was one of the successful lawyers in Cuttack and received the title of “Rai Bahadur”. He later became a member of the Bengal Legislative Council. Subhash Chandra Bose was a very intelligent and sincere student but never had much interest in sports. He passed his B.A. in Philosophy from the Presidency College in Calcutta. He was strongly influenced by Swami Vivekananda’s teachings and was known for his patriotic zeal as a student. He also adored Vivekananda as his spiritual Guru and was deeply influenced by Bhagavad Geeta. He felt India needed spiritual essence. Subhas Bose standing extreme right with his large family of 14 siblings in Cuttack, 1905. Bose decided to take revenge, after reading so many incidents about the exploitation of the fellow Indians by the British. In 1916, Subhash reportedly beat and thrashed one of his British teachers E F Otten. The professor made a racist remark against the Indian students. As a result, Bose was expelled from the Presidency College and banished from Calcutta University. The incident brought Subhash in the list of rebel-Indians. In December 1921, Bose was arrested and imprisoned for organizing a boycott of the celebrations to mark the Prince of Wales’s visit to India. 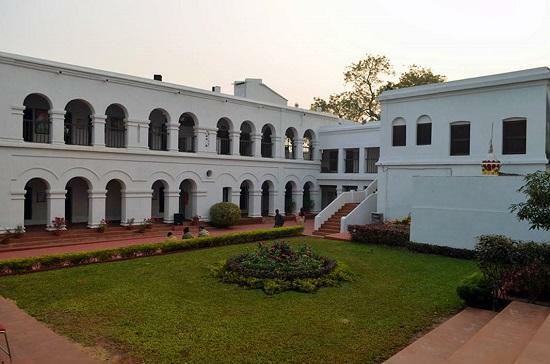 His home: Cuttack, Odisha, where he was born and grew up, now a beautiful museum. Subhash Chandra Bose’s father wanted him to become a civil servant and therefore, sent him to England to appear for the Indian Civil Service Examination. Bose was placed fourth with highest marks in English. But his urge for participating in the freedom movement was so intense that in April 1921, Bose resigned from the coveted Indian Civil Service and came back to India. Soon, he left home to become an active member of India’s independence movement. Netaji had a phenomenal knowledge of Indian history and culture, an aspect that made him reach out to every region in India. Immensely proud of his Bengali heritage and culture, yet at the same time, he recognized the unique cultural synthesis of India, where each and every region, drew something from another region. Bose, later joined the Indian National Congress. Bose worked under the leadership of Chittaranjan Das, an active member of Congress in Calcutta. It was Chittaranjan Das, who along with Motilal Nehru, left Congress and founded the Swaraj Party in 1922. In freedom struggle, Congress was large organization. Subhash Chandra Bose became a strong leader in Congress and he made the brave attempt to mold the entire party differently. After Gandhiji, if there was any other leader, who was able to rouse the masses, it was Netaji himself, such was his appeal. Netaji appealed to youth, the working class, women sections and those too who were not exactly impressed by INC. Congress party was always lenient and never in a position to oppose. Chittaranjan Das, Motilal Nehru, N.C.Kelkar was among the Congress members, who opposed Gandhiji’s suspension of the Non-Cooperation movement in 1923, over the Chauri Chaura incident, creating a division between them and those who supported Gandhiji’s decision. Subash Chandra Bose, along with Vithalbai Patel was becoming increasingly dissatisfied with the tactics of the Congress Party, with both of them favoring an increasingly militant and aggressive approach. Subhash Babu outrightly opposed this behavior. This opposition was against Gandhi‘s philosophy. Deshbandhu’s death in 1925, saw a weakening of the Swaraj Party and Netaji losing his political mentor, which however did not deter him from the action. Already elected twice Mayor of Kolkata, Netaji toured extensively in Europe during the 30’s visiting Mussolini among the other leaders, and that had an influence on his ideology too. The major difference that caused a split between Netaji and the Gandhi faction in the Congress, was the approach towards a total boycott. Netaji felt that with the mood of the nation, totally for a boycott, it made no sense to enter the Councils, it was the best time to exert pressure on the British. He believed it made no use, for Indians to go to the Round Table conference unless they were given full powers. He quoted the example of the pact between Britain and South Africa, where the former had to agree to accept the S.African constitution in full, with no changes, which is what he sought too. He wondered why the British had to send in the European Chambers of Commerce, Ruling Chiefs etc, when this was clearly a matter to be worked out between the British Govt and the Indian representatives. Neta Ji Subhas Chandra Bose, the president-elect of the INC, arrives in Calcutta on 24/01/1938. Gandhiji, Bose, and Patel … Nehru was not even on the scene then. The way Netaji was ousted by Gandhiji and his coterie from the post of INC president at Tripura was a disgrace. Netaji was overwhelmingly voted as President of INC against Gandhiji’s hand-picked candidate B.P. Sitaramaiyah. Gandhijee took this defeat of Sitaramaiah as his own, and refusing to accept Netaji as INC President, went on a hunger strike. 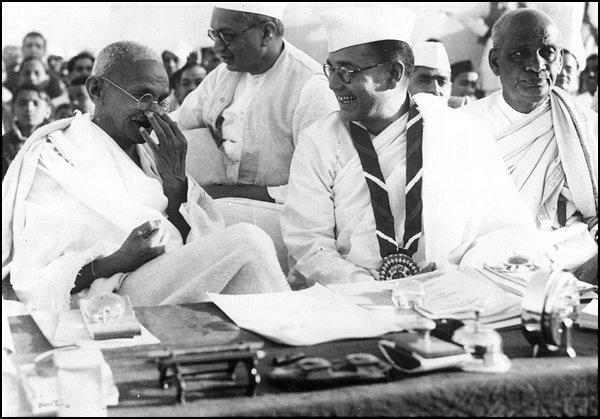 With Gandhiji refusing to accept Netaji as INC President, he was ultimately forced to resign, it was sheer humiliation. In order to acknowledge outside support and get the freedom, he went to Germany, Japan when it was period of the 2nd world war! He decided to induce soldiers from outside to get freedom. Nehru at that time said, “If Subhash would bring soldiers from outside and enter India, then I would be the first person to take sword in hand and oppose him.” This was Nehru’s disgust against Subhash primarily to butter Gandhijee. Netaji was against rendering any kind of help to the British during the World War II. He warned them so. As predicted by Bose, India was declared as a warring state (on behalf of the British) by the Governor General, without consulting Indian leaders. The Congress party was in power in seven major states and all state governments resigned in protest. 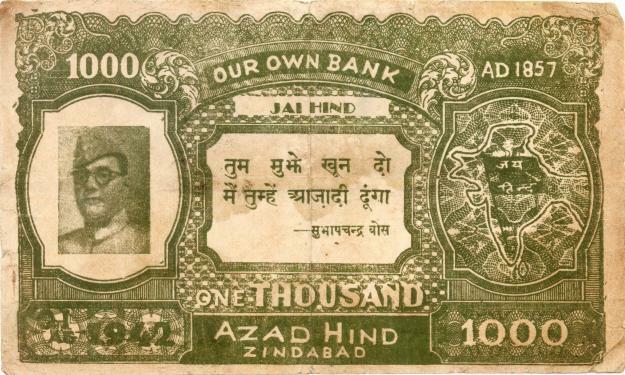 Bose now started a mass movement against utilizing Indian resources and men for the great war. To him, it made no sense to further bleed poor Indians for the sake of colonial and imperial nations. There was a tremendous response to his call and the British promptly imprisoned him. He took a hunger-strike and then was freed and placed under house arrest. It was in 1941, that Netaji suddenly disappeared. He traveled by foot, car, and train and resurfaced in Kabul (now in Afghanistan), only to disappear once again. In November 1941, his broadcast from German radio sent shock waves among the British and electrified the Indian masses who realized that their leader was working on a master plan to free their motherland. It also gave fresh confidence to the revolutionaries in India who were challenging the British in many ways. The crew of Japanese submarine with Subhash Chandra Bose. Neta Ji Subhas Chandra Bose in Greater East Asia Conference, Nov 1943. A rare photograph of Subhas Chandra Bose addressing his troops. “I have said that today is the proudest day of my life. For an enslaved people, there can be no greater pride, no higher honour, than to be the first Soldier in the Army of Liberation. But this honour carries with it a corresponding responsibility and I am deeply conscious of it. I assure you that I shall be with you in darkness and in sunshine, in sorrow and in joy, in suffering and in victory. For the present, I can offer you nothing except hunger, thirst, privation, forced marches and death” – Singapore, 1943. Netaji Subhas Chandra Bose inspects the notorious Cellular Jail on Andaman Island – 1944. Netaji Bose called it the Indian National Army (INA) and a government by the name “Azad Hind Government” were declared on the 21st of October 1943. INA freed the Andaman and Nicobar islands from the British and were renamed as Swaraj and Shaheed islands. 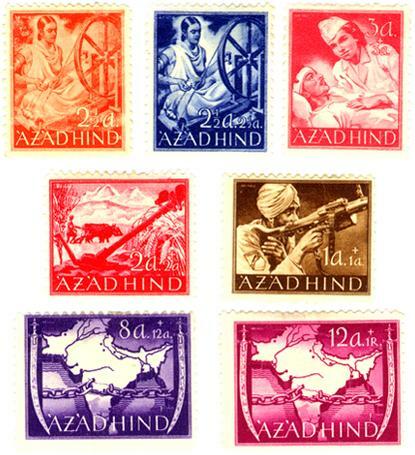 A government was established called the “Azad Hind” having ministers an was recognized in by 10 nations. It also had its own postal stamps and currency. Netaji wanted to free India from the Eastern front. Army leadership, administration, and communications were managed by Indians only. INA marched through Burma and occupied Coxtown on the Indian Border. A touching scene ensued when the soldiers entered their ‘free’ motherland. Some lay down and kissed, some placed pieces of mother earth on their heads, others wept. They were now inside India and were determined to drive out the British! Delhi Chalo was the war cry. The bombing of Hiroshima and Nagasaki changed the history of mankind. Japan had to surrender. In strictly black and white terms, the Indian National Army was a failure. As the dictum goes History is written by the victors and not the vanquished. Leaving aside the merits of Bose’s strategies and his tactics, if we take it on a broader level, the INA, succeeded in many aspects. But more than military victories, the INA, succeeded in winning the hearts of people. Ordinary Indians responded in thousands to his call, people willingly gave money and their gold to him. While all other political leaders just paid mere lip service to cause of women, he raised a woman’s regiment in his army. The INA failed in its final assault on Imphal, because of their dependence on Japanese for logistics, and the heavy rain. As also the superior air power of the British. During his sojourn to England, he met with the leaders of British Labor Party and political thinkers including Clement Attlee, Arthur Greenwood, and Sir Stafford Cripps. Bose also discussed with them about the future of India. It must also be noted that it was during the regime of the Labor Party (1945-1951), with Attlee as the Prime Minister, that India gained independence. Bharat Mata & NetaJi Subhas Chandra Bose published by Picture Publishing Company, circa 1947. Although it was believed that Netaji Subhash Chandra Bose died in a plane crash, his body was never recovered. There have so many theories were put forward regarding his abrupt desertion. The evidence, presented by a whistle-blower and now deceased Congress MP and diplomat Dr. Satyanarayan Sinha in 1952, throws up too many uncomfortable questions, which could upset the established notion that Bose died in that crash and it is his ashes that rest in Renkoji Temple in Japan. Two inquiry reports by Shah Nawaz Committee and one-man GD Khosla Commission, set up in 1956 and 1970 by the Congress governments led by Jawaharlal Nehru and his daughter Indira Gandhi respectively, concluded that Bose died in a plane crash at Taihoku airport. The reports of Justice Mukherjee Commission tabled in Parliament on 17 May 2006 said, “Bose did not die in the plane crash and the ashes at Renkoji temple are not his”. In 2015, PM Narendra Modi’s PMO declassified the secret Bose files that the previous PMOs had refused to declassify. These explosive revelations are contained in 37-odd files. The declassified papers in the National Archives show that the Nehru government initiated snooping on the Bose family and it lasted for two decades from 1947 to 1968. Not only that, Netaji had also raised the largest war chest by an Indian leader in the 20th century. The declassified papers reveal that the Nehru government ignored repeated warnings from three mission heads in Tokyo between 1947 and 1953 about Bose’s missing war chest of 100kg in gold and jewels, for India’s independence. R.D. Sathe, an undersecretary (later foreign secretary) in the MEA, wrote a stark warning to Prime Minister Jawaharlal Nehru in 1951 that a bulk of the treasure – gold ornaments and precious stones – had been left behind by Bose in Saigon, Vietnam, had already been disposed of by the suspected conspirators. All these warnings were ignored. No inquiry was ordered. Why? The startling twist is not about the missing INA treasure worth several hundred crores of rupees today. It is that the government of the day knew about it, but did nothing. Signature of Netaji Subhas Chandra Bose. India’s greatest freedom fighter, Subhash Chandra Bose’s death indicate that he died alone in a Soviet prison in Siberia where over 516,841 perished under Joseph Stalin’s rule probably at the request of ………………. Yes, your guess is as good as mine! BABY : Topical, gritty, engaging thriller ! !